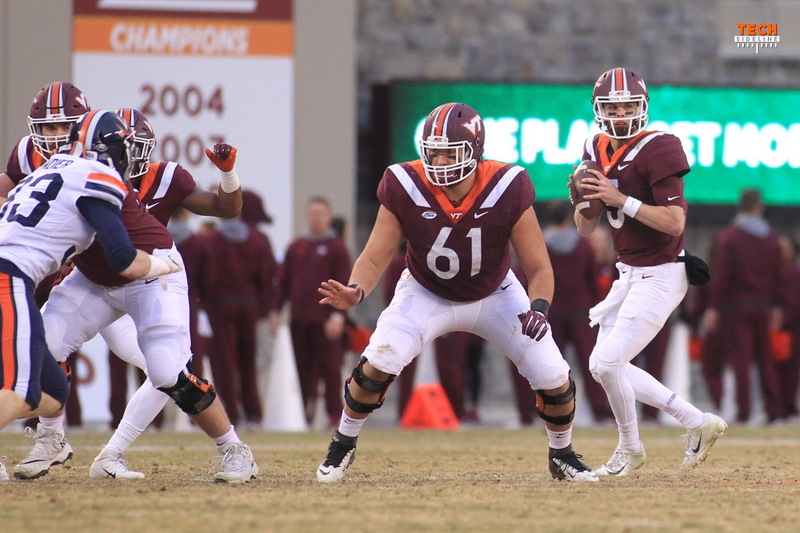 A number of Hokie football players had their chance to impress NFL scouts during the Virginia Tech Pro Day inside the Beamer Barn on Friday afternoon. Yosuah Nijman, Kyle Chung, Braxton Pfaff, Steven Peoples, Ricky Walker, Vinny Mihota, Raymon Minor, along with former players Sam Rogers and Dadi Nicolas all worked out. 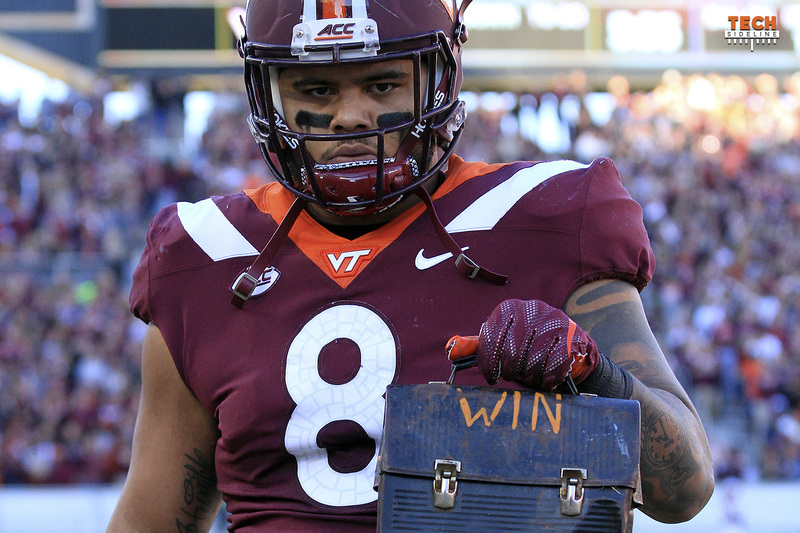 Members from the current team and former teammates, including Terrell Edmunds, Greg Stroman, and Tim Settle, all looked on from the sidelines to watch those nine put up their numbers. 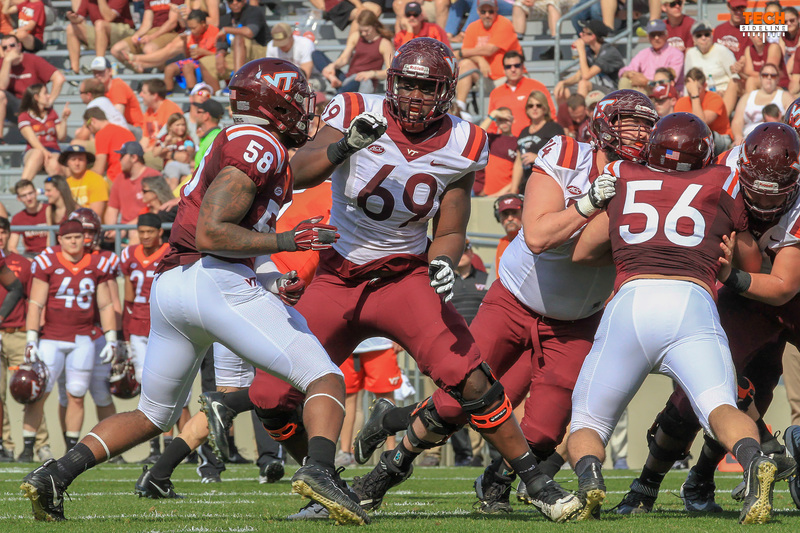 Offensive lineman Yosuah Nijman was the only Hokies player to receive an invitation to the NFL Combine. At the combine in Indianapolis at the beginning of March, Nijman put up 27 reps on the bench press, leaped 114.0 inches on the broad jump, and timed out at 8.07 seconds during the three-cone drill. At the Pro Day, the right tackle ran his 40-yard dash for the first time, and it was a number that ‘wowed’ scouts. Nijman clocked in with a time of 4.83 seconds. His 40 time provides a very good reason to be walking with confidence. At 6-foot-7, 314-pounds, Nijman’s time of 4.83 was faster than all the offensive linemen who ran at the combine. It was a number that had a group of six scouts gathering around Nijman and talking to him at the end of the day. While Nijman’s senior season may not have gone as expected, as he still wasn’t 100 percent, and missed the last three games of the season with a leg injury, he noted that evaluators were impressed with his transition from left tackle to right tackle. Growing up, offensive lineman Kyle Chung had several glimpses into how the draft process works that the normal player would not have. Chung’s father, Eugene, was drafted by the Patriots with the 13th overall pick in 1992. Eugene later went on to be the assistant offensive line coach with the Eagles, then the Chiefs before returning to Philadelphia where he’s been now from 2016-2019. Knowing those little details may have been the difference while training in Miami. Chung walked away from his Pro Day performance with a smile on his face after racking up 31 reps on the bench press, a 29.5” vertical, and a 108.0 inch (9 foot) broad jump. Chung’s 31 reps on the bench press would have been tied for the fifth-most of all offensive linemen at the NFL Combine. He’s also shown the ability to play all five positions on the line, which is an o-line coach’s dream come true. When the NFL Combine invitations were announced in February, many were surprised to see that defensive tackle Ricky Walker’s name was NOT on the list. The snub left a chip on Walker’s shoulder and gave him an extra edge when he traveled to Tampa to train at the same facility where a large portion of the Buccaneers players work out. It was there where he worked with Booger McFarland and began to cut down on his weight, now at 285 pounds when he was 300 pounds at the end of the season. The defensive tackle finally got to display his playmaking ability at the Pro Day. After the event, Walker told reporters that he timed out at 4.95 seconds in the 40-yard dash. It was a number that the bell cow was extremely pleased with after most of his times were over 5.0 during training. Perhaps the biggest win of the day for Walker was the 24 reps he put up on the bench press. Not only did this demonstrate his strength, but each rep was dedicated to the organization Autism Speaks, where Walker raised $1,600. It’s a cause that’s very near to Walker’s heart, as he has two younger cousins, Gracie and Robert, who have autism. 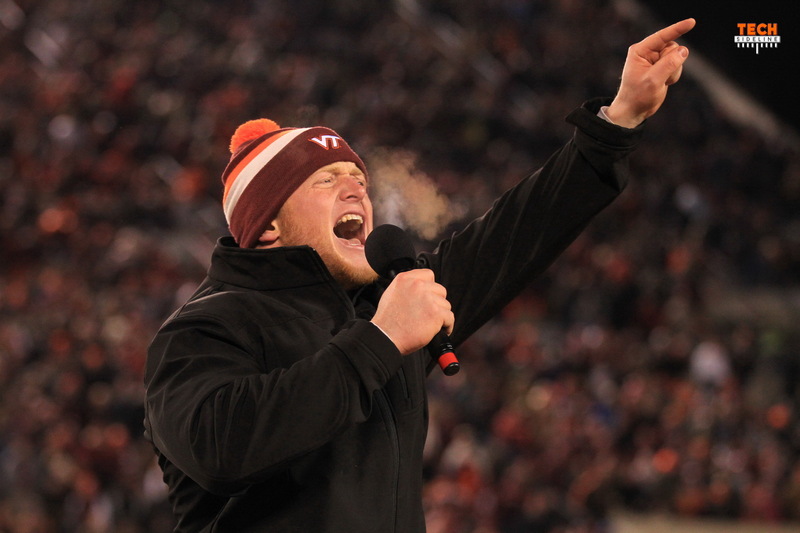 One name that piqued the interest of the Virginia Tech faithful was the appearance of fan-favorite Sam Rogers at the Pro Day. Rogers was drafted by the Rams in the sixth round of the 2017 NFL Draft. This past summer, Rogers was with the Buffalo Bills, but they only kept one fullback on their roster. The former Hokie saw this Pro Day as another chance to showcase himself in front of scouts. Trying to find work as a fullback can be tough sledding. The NFL is quickly shifting to the more pass-heavy, wide open style of play where fullbacks are only used in select packages. During the Pro Day, Rogers ran a 4.80 40-yard dash and ran crisp routes out of the backfield to display his hands. Now on the side, Rogers is working towards a Master of Divinity from Liberty University online, and he works part-time for Young Life, a Christian nonprofit organization. He’s training around the clock, waiting for that one phone call to come through, giving him an opportunity. As he waits, it’s his wife, Lauren, who is his rock and biggest fan. Steven Peoples put up 25 reps on the bench press, ran a 4.70 40-yard dash, and leaped a 32” vertical. The 25 reps would have been good for fourth-most of all running backs at the Combine. Dadi Nicolas was present and clocked a 40-yard dash time of 4.78 seconds. Nicolas, who was drafted in the sixth round in 2016, last played in the NFL in 2017 with the Chiefs. He signed with the Seahawks and Redskins last year but didn’t make either roster. Doubt Mook was allowed to go through pro-day at VT since he was kicked off the team. I could be wrong, but it would be highly unusual. Can’t help but like Sam Rogers. What a great attitude! Nijman at 4.8 in the 40? Hell, make him a middle linebacker! Talk about a Monster of the Midway! teach him how to pass rush and have trim down to about 280…that’s one beast of a defensive end right there. He was playing DE when he was going to FUMA, I believe. Hell yea Sam Rogers, keep grinding!